Or the resulting ‘glow’ may end up being more than you bargained for. You’re staring down a really tough cleaning job in your bathroom when suddenly the bright idea comes to your mind to mix two of your favourite products to get a SUPER sparkly result. Let it go; the idea, that is. You aren’t going to double up the cleaning power and you may very well cause a chemical reaction the results of which could damage a surface at best and your health at worst. You may have tried this with your kids as an experiment but the science behind it is relatively simple. Ultimately, placing this combo into a closed container could actually build up enough sodium acetate to explode. 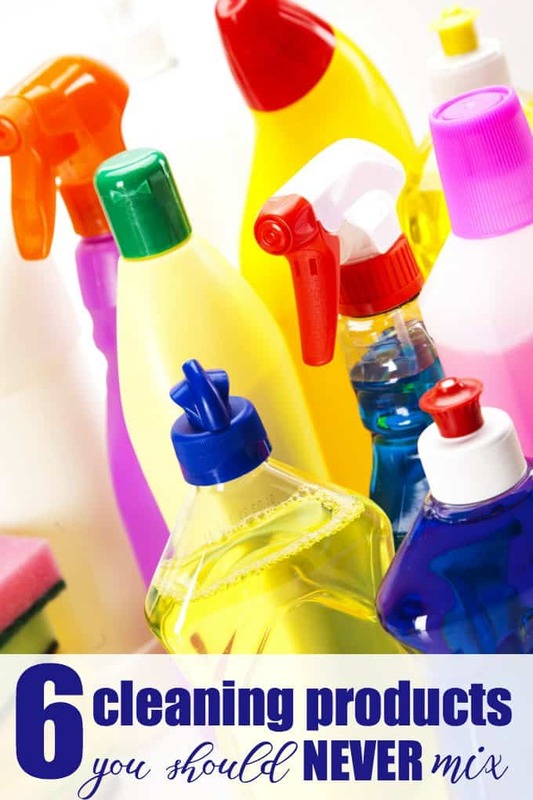 While many of us use both of these fairly common household products, the key is not to combine them in the same bottle. The resulting acid is corrosive and can cause irritation of the eyes and skin as well as respiratory difficulties. Vinegar is an acid. When you mix it with bleach, the combination releases a toxic chlorine gas. Inhaled, this gas can cause chemical burns that create difficulties with breathing and burning eyes, nose and throat. To that end, you need to be careful of mixing chlorine bleach with any acid based product, or you could have a similar effect. Example? Acid based toilet scrubbing products. While the combination has been used in the disinfecting of water at municipal water boards, in place of straight chlorine, it also produced a toxic vapour. This vapour can not only cause breathing difficulties and burning eyes, but also throat pain from chemical burn, shortness of breath and chest pain. In other words: No. While the chloroform it produces—you know, that stuff the bad guy put on a rag in the old movies to make his victim pass out—won’t likely cause you to lose consciousness, it is nonetheless irritating to your eyes, nose and mouth, and can cause breathing difficulties. Hydrochloric acid is highly corrosive and dangerous to inhale or touch, affecting your nervous system, lungs, eyes, and skin. Don’t mix it with anything except water. Ever. Its active ingredient, sodium hypochlorite, reacts with any acids or ammonias. Many pool chemicals contain sodium hypochlorite so this is another area where you need to be extra careful about combining products, when cleaning. You are using one to un-block a stubborn drain, but it’s not doing the trick so you think about following up the first dose with a second one from a different brand. This can be an explosive combination. Literally. If you followed the directions on the first bottle and it’s still not clearing, it’s time to stop the DIY and call a plumber. Make sure you let them know what you used before they start any work. Need a natural way to unclog a toilet? Mix two cups of baking soda with a quarter cup (¼) of Epsom Salts. You want the mixture to be smooth. Add eight tablespoons of liquid dish detergent, one tablespoon at a time, stirring all the while until you get the consistency of wet sand. Fill muffin tin liners with the mixture, pressing down into the muffin tin to get it as compact as possible and let the ‘muffins’ dry overnight. You can store the resulting ‘muffins’ in a well sealed container. Put one, without the liner, in the clogged toilet and add four cups of hot water. Let it sit for at least a couple of hours or overnight and then flush. If all goes well, you should have an unclogged toilet. About 10 years ago, I was cleaning my toilet and caused some kind of chemical reaction. I can’t remember what exact cleaning products I was using, but I know it was two different kinds. I wasn’t thinking obviously and started to panic when the bathroom filled up with a horrible chemical smell. Then it spread to the rest of the house. I quickly opened up some windows and got everyone out. We had to stay outside for hours while the house aired out. Needless to say, I’m much more careful now when I’m cleaning! Have you had any cleaning product mishaps? People have mixed bleach with ammonia and died. It is never safe to mix cleaners. So dangerous. I have never mixed a cleaner and had toxic fumes. Thanks for sharing this post i shared.You can’t be too careful with cleaning products! I will be more careful with these chemicals, hardly ever use bleach or heavy chemicals for cleaning, but I didn’t know bleach reacts with a lot other things, not just ammonia. Thanks. Thanks you for the tips. We use some of these methods as well. I’ll have to try the cleaner for unclogging the toilet. There are unfortunately a lot of people who don’t know how dangerous it is to mix some cleaning products. A great and important post, thanks for sharing. I’ve always been very careful not to mix bleach with an other substance. I value my lungs…. I always try to be careful with any cleaning products that I use and appreciate the reminder. Fortunately. we have not had any cleaning product mishaps and hope to keep it that way. I actually use the vinegar and baking soda trick to help keep the sink drains moving smoothly – although I try not to let hair get down them between my husband trimming his beard and just regular brushing etc. it happens. I just avoid using bleach, since I don’t like it. I would definitely try the cleaner for unclogging the toilet though. I know I’ve made the same mistake of mixing products and causing a reaction. I’m more careful now. I’ve never seen this recipe for unclogging a toilet. Gonna give this a try. Thanks for the suggestions! I am very happy to have read this article. I shall never mix bleach with anything except water. I shall also be very careful with vinegar. I wouldn’t say never for the 1st two as they are useful in some situations. So, there are exceptions. Good to know these tips. Thanks for sharing. I used a combination of bleach and ammonia and ended up in intensive care for five days. I certainly learned my lesson. Thanks for the other tips!